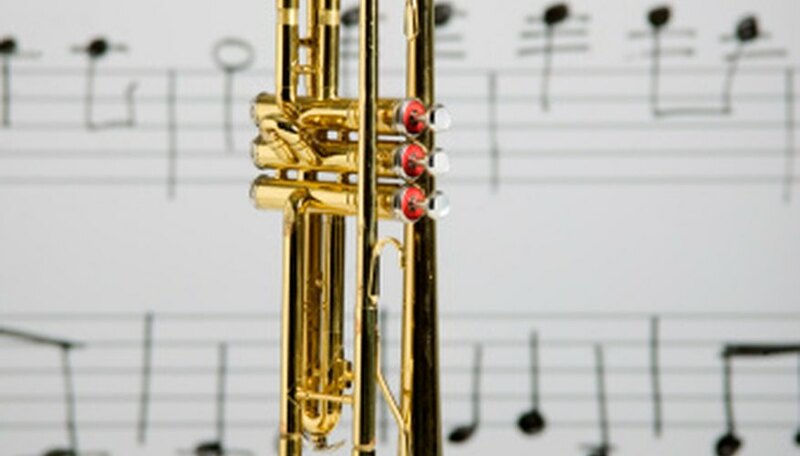 A trumpet uses vibrating air to create controllable sounds through a series of key-activated valves. You can make a homemade trumpet mouthpiece from supplies acquired at a hardware store. You will also need to use tools that most homes have on hand. The mouthpiece will make sounds on its own, but can also be attached to a trumpet’s body to enable more control over the sounds being made. Place the PVC tube horizontally on a work surface. Measure 3 1/2 inches in from an end of the tube. Make a dot on the tube at the 3 1/2 inch mark with a pencil. Cut through the tube at the dot with a handsaw. Place the excess tube aside. Sand the two ends of the cut piece of tube with fine-grit sandpaper. Wipe the ends free of loose dust with a clean rag. Blow through the tube with a burst of compressed air. Hold the PVC right angle joint so that one end is facing up. Insert an end of the cut tube into the end of the joint that is parallel with the floor. Twist the end of the tube into the joint. Hold the tube so that the open end is facing up. Hold the garden hose adapter so that the rubber gasket is facing up. Insert the end of the garden hose adapter that's opposite the gasket into the open end of the cut tube. Twist the garden hose adapter into the cut tube. Purse your lips. Place the gasket end of the garden hose adapter that's now a trumpet mouthpiece against your lips. Blow into the adapter to make sounds come out of your trumpet mouthpiece. Wear work gloves to protect your hands when cutting the tube.